A shift from conventional vaccines to more rationally designed approaches is a hallmark of the new revolution. Infectious diseases have shaped humanity more than any other single factor in history. Despite the substantial morbidity and mortality associated with pathogens, eradicating infectious diseases has been challenging, both in terms of generating vaccines and in ensuring that immunization campaigns can be affordable, effective, and feasible on a global scale. The only human infectious disease that was eradicated worldwide as a result of vaccination initiatives was smallpox, and with three countries—Afghanistan, Nigeria, and Pakistan—remaining endemic in early 2014, poliomyelitis is expected to become the next target for global eradication. Advances in sequencing technologies and the increasing availability of microbial genomes catalyzed one of the great strides in vaccinology. This consisted in the shift from conventional vaccines, which are based on inactivated or killed microorganisms or subunit vaccines, to more rationally designed approaches. One of these advances consisted in the development of reverse vaccinology, a genome-based approach in which scanning the entire genome of a pathogen allowed, without the need to grow the microorganism, the identification of genes encoding proteins with certain desirable characteristics, which were then expressed and tested experimentally for their ability to confer protection in vivo. However, rationally designed vaccines open multiple challenges. “Most rationally designed vaccines do not work as expected during their initial developmental stages and fail to produce immune protection, even after multiple dosages,” Dr. Barh commented. Dr. Barh and his colleague Vasco Azevedo, D.V.M, Ph.D., professor at Instituto de Ciências Biológicas, Universidade Federal de Minas Gerais, Brazil, have made significant advances toward designing drugs and vaccines for cholera, an infectious disease that remains a global public health concern. In the case of cholera, multiple serotypes of the pathogen are responsible for epidemics. The oral whole-cell, killed cholera vaccine, which is based on cholera toxin, is only effective against two serogroups, O1 and O139, and no broad-spectrum vaccine has been available so far. “These two serogroups are not the only pathogenic ones, and several other Vibrio serogroups cause the epidemic in various geographical regions,” said Dr. Barh. Therefore, there is a need to develop multivalent broad-spectrum vaccines. “The main constraint in designing next-generation vaccines for cholera is the identification of proper vaccine candidates and their clinical evaluation, and this is due to the large genome size, the genomic variations among the serotypes, the lack of proper animal models, and the lack of international and collaborative efforts,” he explained. “When we approached the vaccine, we wanted to have information available about all the genes that are encoded in the genome, to identify the proteins that are expressed and elicit an immune response during infection,” said Harry L.T. Mobley, Ph.D., professor and chair in the department of microbiology and immunology, University of Michigan Medical School. Several major projects in Dr. Mobley’s lab focus on developing a vaccine against uropathogenic Escherichia coli, the primary cause of urinary tract infections. In one of the recent experimental strategies that they used to identify vaccine candidates, Dr. Mobley and colleagues removed surface-exposed peptides from the bacterial cell surface by limited proteolytic digestion, and identified the fragments by using mass spectrometry. “This identified not only the proteins that are expressed and are on the bacterial cell surface, but also revealed the specific parts of the proteins that are exposed,” he said. The fragments that are exposed have a higher likelihood of being important in eliciting an immune response, and they can subsequently be tested in vivo for their ability to confer protection. This approach provides a promising strategy to identify vaccine candidates for other pathogens as well, if an animal model of pathogenesis is available and results from omics studies can be integrated with the in vivo studies. In another strategy recently used in the Mobley lab, a genomic expression library, generated from a human pathogenic strain, was screened against sera collected from mice chronically infected with the strain and adsorbed against bacteria cultured under in vitro conditions. This immunoscreening approach, known as in vivo-induced antigen technology, identified, in the first stage, 93 genes from a pool of 40,000 clones. The in vivo expression of several representative genes identified from this pool was examined by quantitative PCR, and mutants that targeted these genes for deletion revealed, in an animal model, that one of them is an important contributor to virulence, emerging as a promising vaccine candidate. “Our approach is to analyze the cell surface of parasites at different stages of the life cycle, and try to dissect their contribution to pathogenesis to develop more rational vaccines,” said Igor C. Almeida, Ph.D., professor of biological sciences at the University of Texas at El Paso (UTEP). Dr. Almeida and colleagues are focusing on Trypanosoma cruzi, the causative agent of Chagas disease, a condition that has become increasingly more relevant in the United States and many other countries worldwide particularly as a result of the very intensive migration of people from endemic to nonendemic countries. This parasitic infection is particularly challenging when it occurs during pregnancy. The challenge in designing a vaccine is that the only way to learn about the proteins expressed on the surface of the trypomastigote, which is the infective form of the parasite and lives in the mammalian host, is by proteomic analysis. “To learn about the antigens that are expressed on the parasite surface and can be therapeutically targeted, proteomic analysis has to be performed not only in different parasite stages but also in different strains, and this is what our lab has been doing in recent years,” Dr. Almeida said. 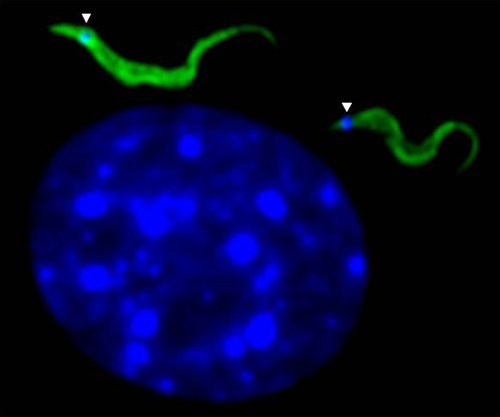 An additional hurdle in generating vaccines against protozoan parasites is that sometimes, even though they work in the experimental settings, this may not always be true in the field, due to the fact that field isolates do not always express the specific antigens that the vaccine was developed against. “This is happening for other parasites as well, and it is the reason why so far we do not have a single vaccine against any parasites, despite the fact that they cause diseases affecting over 1 billion people worldwide,” he added. Research in Dr. Almeida’s lab has focused on the analysis of surface antigens mainly at the trypomastigote and intracellular amastigote forms, in an attempt to find molecules that are conserved and can be recognized by patients from different geographic locations. “Unfortunately, the parasite has a very complex cell surface, and this makes it challenging to generate a vaccine,” he said. The strategy that Dr. Almeida and colleagues used involved a proteomic analysis to identify and characterize, at each of the parasite stages, conserved antigens that are vaccine candidates. “As a proof of concept, using this approach, my group in collaboration with the group of Dr. Rosa Maldonado at UTEP were able to develop a vaccine based on a protein that is found in the T. cruzi secretome,” Dr. Almeida said. After fractionating culture supernatants, a proteomic analysis of the trypomastigote stage of the parasite secretome identified thousands of peptides, from which and a more narrow number of candidates was selected. Subsequent immunoinformatics studies to predict T-cell and antibody epitopes revealed a peptide of interest, which, after being synthesized and attached to a carrier protein, was able to prime the immune system. “In a mouse model, this peptide was 90% effective in controlling the infection,” he commented. Dr. Almeida’s group has also been developing a vaccine based on sugars that are unique to T. cruzi. “The parasite surface is covered by a thick coat of sugar-containing molecules or glycoconjugates,” he said. “Although highly immunogenic to humans, these glycoconjugates have not been exploited as vaccine targets, mainly because of the technical difficulties in structurally characterizing and synthesizing carbohydrate epitopes or glycotopes.” Using transgenic mice that do not express a particular highly immunogenic sugar expressed by the parasite, Dr. Almeida’s group has recently developed a fully protective vaccine that is now undergoing trials in nonhuman primates. One of the many disciplines that benefited from the omics revolution, infectious diseases have entered a new era, characterized by the transition to rationally designed vaccines as one of its defining features. Human pathogens are expected to continue to inflict significant morbidity and mortality worldwide, both as a result of acute and chronic infectious diseases and in terms of the chronic medical conditions, such as cancer, which were causally linked to certain pathogens. The transition to novel vaccination strategies has far-reaching implications that extend to all groups of human pathogens and promise to fill a longtime gap in preventive medicine and global public health.